Ultra-Duty PIG Wipes are strong, soft and low-lint so they won't leave fabric fibres behind. 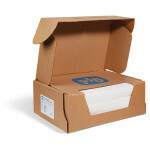 New Pig Ultra-Duty wipes are binder-free and unaffected by solvents making them the ideal replacement for shop towels. Perfect for scrubbing parts, tools and rough surfaces in any facility.